I chose the above date as the starter because this was the date that the route was converted from STL to RT. Extended from Central Parade to Salcot Crescent. Extended from Salcot Crescent to Homestead Way via Arnhem Drive. Sunday extended from Croydon to Streatham Common. Diverted in Croydon via George Street instead of Katharine Street. Express service introduced Mon-Fri peaks and Sat shopping hours. Streatham terminal changed to Streatham Garage. RT 241 at East Croydon Station - George Street heading towards Central Croydon. Sunday only Thornton Heath allocation introduced with RM - spare from Route 64. Sunday only Thornton Heath allocation converted to RT because Route 64 was converted to OPO thus removing Routemasters from that shed. Croydon allocation converted to front entrance double deck operation. Thornton Heath allocation converted to Routemaster operation as Route 109 was converted. 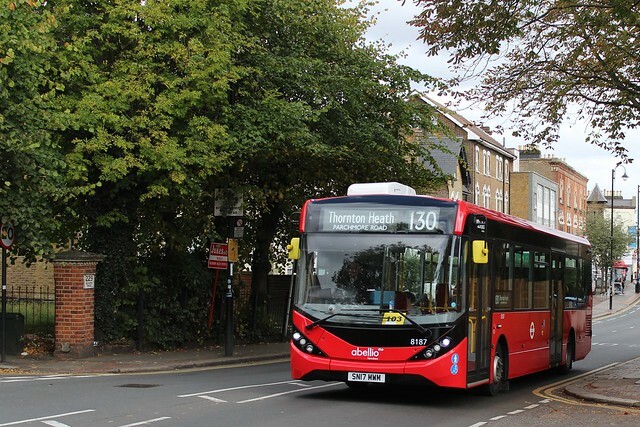 Thornton Heath allocation converted to DM operation as Route 109 was converted. Mon-Sat withdrawn between Thornton Heath Garage and Streatham - replaced by new Route 60 and further withdrawn Mon-Fri peaks between West Croydon and Thornton Heath Garage. Sunday service extended from Streatham Garage to Brixton Garage. Mon-Fri evenings withdrawn between West Croydon and Thornton Heath. Withdrawn between West Croydon and Brixton Garage - replaced by Sunday service on Route 60. Re-routed in New Addington via Fieldway - Dunley Drive - Headley Drive,Goldcrest Way - King Henry's Drive and Gascooigne Road instead of Lodge lane and Montacute Road. 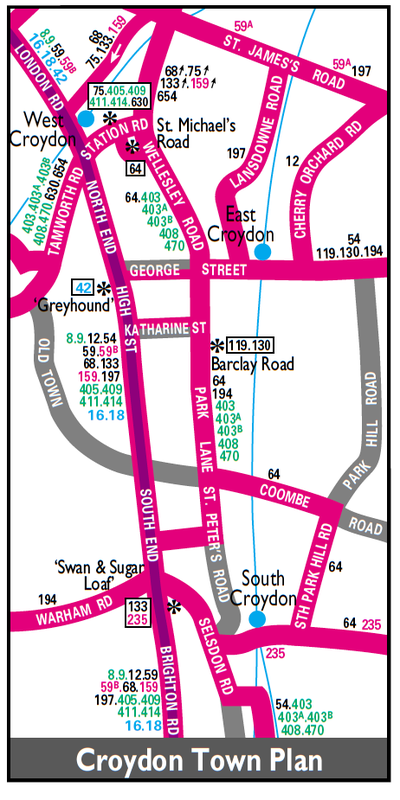 Mon-Sat (except evenings) additional service introduced between West Croydon Bus Station and NEW ADDINGTON Vulcan Way via above routeing to Arnhem Drive and then King Henry's Drive. Service increase to compensate for 130B withdrawal. MS Vulcan Way journeys withdrawn. MS evenings and Sunday withdrawn. Certain early morning journeys off Route N159 introduced from New Addington to West Croydon. The routeing via Croydon town centre withdrawn with eastbound buses at East Croydon Station serving the Dingwall Road stop instead of the College Road stop. The N159 passed to Arriva thus London Central involvement finished. Diverted at Shirley Park to Norwood Junction instead of West Croydon and Sunday service added. 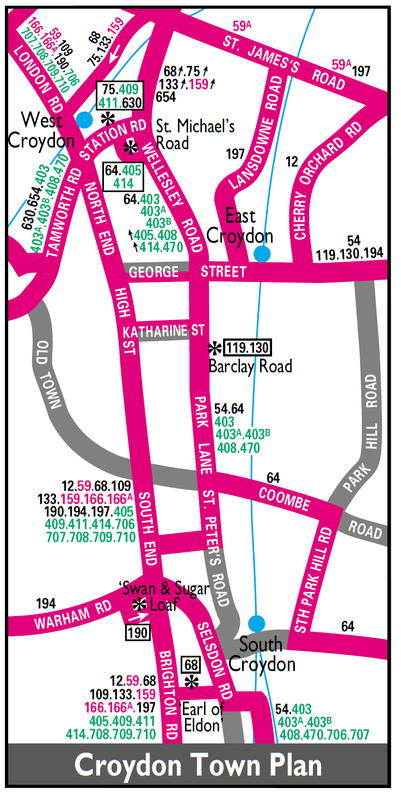 Route 130 had two relief points whilst TC based: Some had reliefs at West Croydon Bus Station - either taken on site or travelling back to TC whilst others operated in service to TC - either on a bifurcation at George Street via High Street - South End and Brighton Road or operated out of service from West Croydon. Changeover point at West Croydon ?